JUST 48 per cent of my constituents are white British born like me. The majority are from all corners of the world. Kensington has given refuge to families fleeing war, religious and political persecution and severe economic deprivation. Growing up in the area I now represent and listening to their stories has given me a solid and unshakable sense of social justice. We have 6,156 Latin Americans in the borough, and I estimate a majority live in the less expensive areas of North Kensington. I have a responsibility for them — and for their relatives, wherever they are. This is why I am concerned by the ambitions of the Trump executive and his allies, driven by greed for oil and a desire for political supremacy in Venezuela. Donald Trump’s campaign is nothing to do with concern for people suffering appalling economic privations, which they clearly are. This is a deliberate attempt to overturn the internal affairs of a sovereign state in order to monopolise oil supplies for profit. Bolton also accidentally revealed a note discussing “5,000 troops to Colombia” which shares a long border with Venezuela. We need to be very concerned about the repeat of the disastrous war for oil that we saw in Iraq. The Venezuelan economy has buckled under a combination of the burden of oil price collapse, poor policies — plus US sanctions from 2017. Sanctions have caused a cease in international loans and a halt in availability of basic medical supplies, including for life-threatening diseases such as diabetes and cancer. The UN has warned of the effects of sanctions. In imposing them, Trump will deliberately undermine the health, wealth and stability of Venezuela at a time when what is needed — and indeed has been asked for — is negotiation and support. This is nothing to do with social commitment. It is everything to do with social, political and economic control. The situation in Venezuela resonates across the world. It is not the only place on Earth where the result of elections and referendums are in question. The US presidential election and British referendum are both under heavy scrutiny for alleged illegal financial lobbying and even potential foreign interference. It is not the only place on Earth where a duly elected government is struggling under extreme economic difficulties — exacerbated by sanctions — to provide the basic essentials for survival. So, let’s be clear about this. 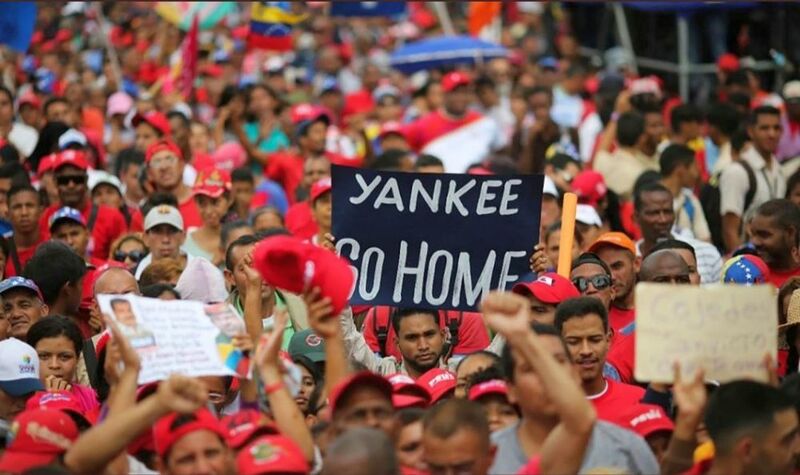 The US support for an unelected opposition leader and threatened military intervention is about a grab for Venezuela’s huge oil reserves, the largest in the world. US-backed “interim president” Juan Guaido has pledged to allow US oil companies to replace the government’s current majority stake in Venezuela’s oil industry and hand over greater control to private interests. It is very clear that the ambition of the US is to control and exploit the natural resources of a sovereign state, whose politics they oppose, for financial gain. How ironic that Trump, if successful, could use Venezuelan oil income to build his Mexican wall, to keep out the political and economic refugees he will have created. Outside forces need to ensure that they don’t risk fomenting a civil war in Venezuela like that which caused tens of thousands of deaths, millions of displaced people and widespread suffering in neighbouring Colombia for half a century. The way forward is dialogue and a negotiated settlement, not military intervention and sanctions. Not just for the situation in this country now, but for all the Venezuelas to come across the world. If I don’t speak out I will have failed all the refugee families who have made Kensington their home. Emma Dent Coad is Labour MP for Kensington.